As archers, we are concerned with accuracy and arrow speed. Many bowyers claim that their bows are the fastest bows. My search for the most powerful bow led me to the Bible: "And the Lord shall be seen over them, and his arrow shall go forth as the lightning..." (Zechariah 9:14). "God is angry with the wicked every day. If he [the sinner] turn not, he [God] will whet his sword; he hath bent his bow...he ordaineth his arrows against the persecutors [sinners]." Here God describes Himself as an archer preparing for war. In the day of judgment, even the self-confident archer will fall at His feet: "...neither shall he stand that handleth the bow..." (Amos 2:15); "...every knee shall bow..." (Philippians 2:10). Missing the Target Romans 6:23 tells us, "All have sinned and come short of the glory of God." To "come short" means to miss the mark. Every archer knows what it is to miss the target. We have missed the target of righteousness. The penalty for sin is death: "The wages of sin is death..." (Romans 6:23). As sinners, we face a spiritual death--separation from God in a place called hell (Revelation 20:11-15). We are sinners by nature and sinners by choice: "...by one man [Adam] sin entered into the world..." (Romans 5:12). We have rebelled against God, and we deserve punishment. God's Perfect Arrow In spite of our sin, God loves us; however, God's righteous nature will not allow Him to excuse our sin. Therefore, God sent His Son Jesus Christ to die on the cross taking our punishment upon Himself: "Who his own self bare our sins in his body on the tree..." (I Peter 2:24). In Isaiah 49:2, Jesus is called the "polished shaft." He is God's perfect arrow. He was not a sinner (Hebrews 4:15). Jesus, the righteous One, died for all sinners. God accepted His sacrifice and raised Him from the dead (Romans 1:4). He is now seated at the right hand of God, but He will soon return in judgment. He is the "arrow" of Zechariah 9:14. His coming will be as the lightning (Matthew 24:27). God's Promise of Salvation God has promised to save us if we will place our trust in Jesus Christ as our Saviour. Romans 10:13 tells us, "For whosoever shall call upon the name of the Lord shall be saved." When we realize we are sinners and humbly come to God seeking His forgiveness, He has promised to forgive all of our sins (I John 1:9). If you are sorry for your sins and are willing to tum away from the old life, take God at His Word; and trust Him this very moment. Call out to God in prayer; ask Him to forgive you and to save you. Attend a Bible-believing Church, and be baptized. Write and let us know of your decision. Remember the words of Lamentation 3:12: "He hath bent his bow, and set me as a mark for the arrow." God's judgment is coming. Be ready to meet Him! The goal of many modern day hunters is not only that of harvesting a deer, but harvesting a trophy buck large enough so that they get their name in the book. We hunters spend countless hours scouting the fields and forests for the clues that will lead us to the right stand location. Then we devote more time waiting in the stand for the mature buck to appear and offer us that opportunity to put our name in the book. When that mature animal arrives at our stand what we do will determine whether or not our names will be entered in the book. The Bible tells us of another book where our choices determine whether or not our names are entered. In Rev. 20:15 we find "and whosoever was not found in the book of life was cast into the lake of fire." 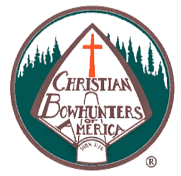 A lot of hunters know by heart the requirements for getting their name in either the BOONE & CROCKET or POPE & YOUNG record book. Both have established guidelines and minimums for entry. Just as a good set of antlers may miss the mark and fall short of the minimum for entry; the Bible tells us that all good men, including you, have already missed the mark of living a sinless life. Romans 3:23 states "for all have sinned and come short of the glory of God." We have all missed the mark yet there is hope, for in Romans 5:8 we read "but God commendeth his love toward us in that while we were yet sinners Christ died for us." Jesus Christ, God's Son, lived a perfect sinless life and died on the cross, paying the penalty for your sins and mine. Romans 6:23 tells us of this sacrificial gift, "for the wages of sin is death, but the gift of God is eternal life through Jesus Christ our Lord." The Bible also tells us that no matter how hard we try we cannot earn our way into "The Book" or heaven. Titus 3:5 teaches that, "not by works of righteousness which we have done but according to his mercy he saved us" and in Romans 10:9-10 we find out how to get our name in "The Book;" "if thou shaft confess with thy mouth the Lord Jesus Christ and shalt believe in thine heart that God hath raised him from the dead, thou shalt be saved, for with the heart man believeth unto righteousness; and with the mouth confession is made unto salvation." We know this because a few verses later in Romans 10:13 we read that, "whosoever shall call upon the name of the Lord shall be saved." Friend, that "whosoever" means you. If you would like to be sure that your name is written in the BOOK OF LIFE and that heaven will someday be your home, pray the following prayer and mean it with all of your heart. "Dear Lord Jesus, I know that I am a sinner and cannot save myself. I believe that you died on the cross for my sins. I repent of my sins and trust Jesus as my own personal Savior. Thank you Lord Jesus for saving me. In Jesus name I pray. Amen."